When Jen Lockett completed her first Ironman at Bolton 2011, she decided that competing at iron distance was next on the cards. But when an Achilles tear put paid to her intensive training plans, she knew that she needed a new challenge to inspire her. In 2013, she became the first ever woman to complete the Double Brutal ultra triathlon by swimming, cycling and running her way to the 287.82 mile finish line in 37 hrs 38mins. ‘Brutal events set in stunning surroundings.’ This is the tagline for Claire Smith’s mastermind, Brutal Events, which includes the ultra iron distance event held annually in Wales, UK – the Double Brutal. Well, doesn’t that just sounds delightful. Claire set up the Brutal Events to start up a double iron distance that packed a bit more of a punch. “Typically, ultra long distance events tend to be on smaller, safer and flatter courses, and I felt that there was a market for an ‘extreme’ version of a double iron event.” Claire says. The Double Brutal consists of a 4.8 mile swim, 231.92 mile bike ride and 51.1 mile run. 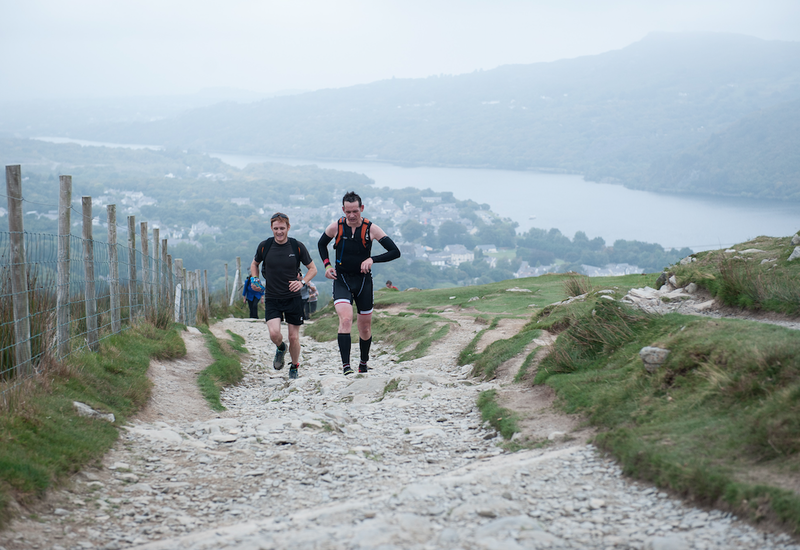 Each section of the Double consists of 8 laps or more, including an ascent/descent of Snowdon as part of the run. 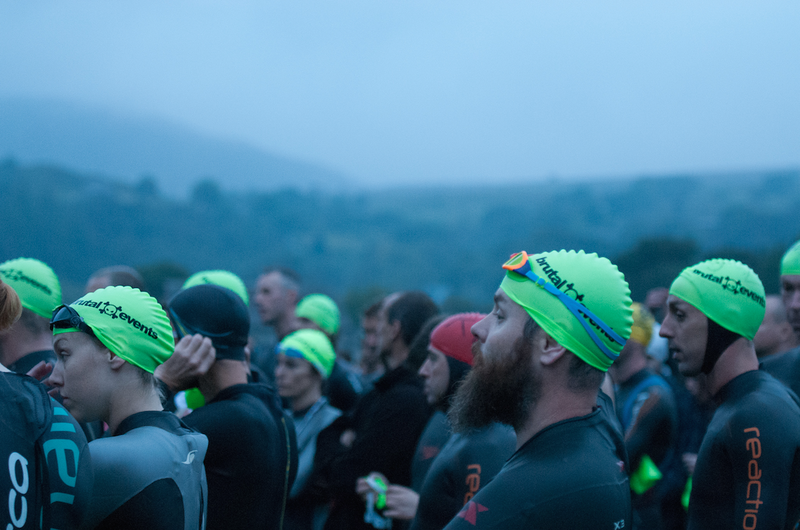 The race begins at 7am in chilly Lake Padarn, a glacial lake of Snowdonia, one of the largest natural lakes in Wales. Temperatures are typically 12-14 degrees celsius, and you could be in there for up to 4 hours (cut-off time for swim exit). Yeah, I’d say that’s ice cream headache territory. 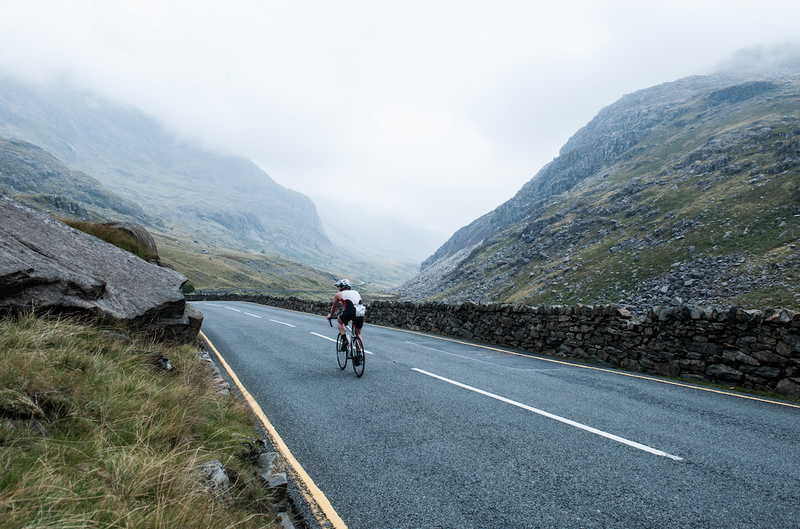 Smith’s events are as beautiful as they are brutal, for the settings within which people swim, cycle and run their way to the Brutal finish line after tackling Mount Snowdon, are reminiscent of ads for holidaying in New Zealand, or of scenes in films about dragon slaying and ring finding. What’s more, whilst super tough, the events are renowned for their low-key and friendly vibe. The Brutal Extreme Triathlons have four race options, a half, full, double and triple (as you do, next race to be held in 2017). A friendly vibe though there may be, Jen recalls quizzical looks of bemusement toward the rare breed of Double starters – in a total field of 139 (all three races combined) there were just 15 Doublers at the start line in 2013, and of those, just one woman – Jen. During the swim section, hot tea in the exit/entry area is provided for those feeling the cold. The briefing pack states: ‘Anyone who is showing symptoms of hypothermia will be attended to. If the medics feel it is unsafe for you to continue, you will removed from the race. The medics decision is final.’ That would be me after lap one then! 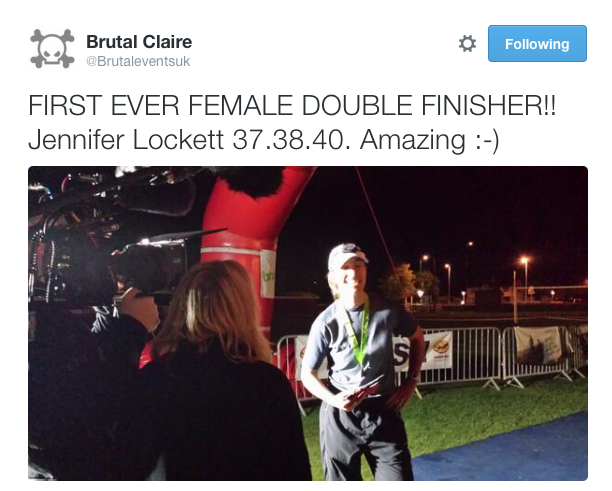 Jen’s Double Brutal medal was 37 hours and 38 minutes in the making, well within the 42-hour cut-off. She started alongside the 138 other competitors doing the half, full and double, at 7am, and finished just after dark the following day along with just 13 others. When asked about her sporting prowess, Jen’s extremely humble. “In races I often end up resorting to some form of doggy paddle,” she says. Jen describes her swimming technique as providing little forward propulsion, her body like a stone in the water, and her training discipline as haphazard at best, but it is clear that her mental attitude makes up for any technical difficulties she faces, such as ‘going backwards’ whilst doing the leg drills at tri club swim sessions. After a series of increasingly tough triathlons, Jen signed up for her first Ironman in 2011. “I took a haphazard approach to training, but fear of not finishing meant I gradually increased my cycling each weekend and introduced some brick sessions. In what felt like no time at all, I’d arrived on the Ironman start line, ready to swim and cycle further than I ever had before, and then attempt to run a marathon. I was seriously concerned about the cut off times, my aim was to just get round. As ever my body formed the shape of a very effective anchor on the swim, and on the second lap I got cramp in both calves and was sick! Eventually my doggy paddle got me to the end before cut off, much to my relief,” Jen says. Jen surprised herself by finding the marathon fun. “There was a fantastic atmosphere, I finished the race hooked on endurance events.” She says. Ironman finish in the bag, Jen was determined to improve her swimming and start competing at Iron distance. Unfortunately, three months after the race she partially tore her Achilles tendon, which meant high intensity training went out the window. A few months on, her work took her to a desk job in Afghanistan, and training suffered further. “I could only run one-mile circuit loops on uneven ground, cycling was an exercise bike in a tent, and swimming was non-existent,” Jen says. Jen started researching a tough triathlon, and Extreme Events came up on a Google search. “I can never pick the easy option. When I discovered the Double Brutal I knew that would scare me into training,” she said. Jen got back to the UK with nine months to go until the race. “I hadn’t swum properly in a year, run more than a couple of miles at a time, or cycled for more than 2 hours,” she says. Jen booked a half iron and a full iron distance in as part of her training in the months that followed to the Double start line. All three races and 139 Brutallers in total went off at 7am. “There was muttering about nutters in the general direction of the Double competitors,” Jen says. “I had eight laps to swim, so the field quickly thinned out. I was slow but my body was coping aside from losing control of my mouth due to my face going completely numb – I struggled to eat jelly babies on the last feed station much to my support crews amusement!” Jen says. Jen started the incredibly beautiful bike course at 10:45am and finished it at 5:15am the following morning. “As I started the eight lap bike course, each lap just under 30 miles, I gradually regained the feeling in my hands and feet, and stopped shaking. I was pleased the route was pretty because I’d be looking at it for the rest of the day and all night,” she says. “The fog came down overnight, there was an eerie feel when combined with exhaustion,” Jen recalls. “I set myself stupid challenges to maintain focus, for example maintaining a specific cadence or getting to a certain point in a set time, or getting a new top speed on the descents. In the early hours I sang out loud to keep myself awake,” Jen says. Max had agreed to act as Jen’s support crew on Snowdon. “Off we went. I could see a couple of other competitor’s head torches in the distance – we were all now fighting our own solo battles. I felt stronger than expected and maintained a consistent pace up Snowdon. I made it back down just after sunrise, still feeling in reasonable shape,” she says. Jen’s knee deteriorated, and Jen had to walk the latter part of the course. 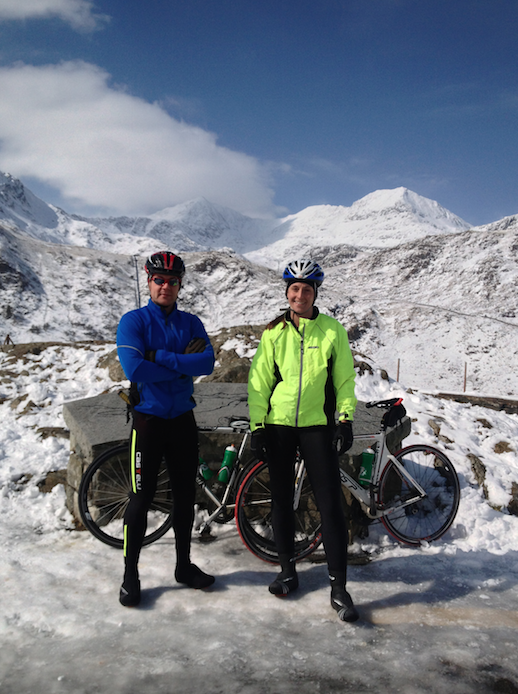 “I was paying for an eager start and a fast descent of Snowdon by slowing to a shuffle,” Jen says. “I finished just after dark, slower than I’d have liked.” Despite a better-than-expected sub-38 hour time, Jen says she will return to the Double Brutal and run the full ultra one day. 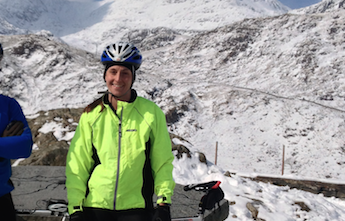 “I’d completed what I set out to do by getting my fitness back and inspiring a taste for unusual endurance events in picturesque locations.” The following year she completed an ultra marathon across Hadrian’s wall, a mountain bike ride from the west to east coast of the UK, she cycled from Wembley to Murrayfield, completed the City to Summit Iron distance triathlon and man vs mountain adventure run. Phew. “The key in completing endurance events is mental strength,” Jen says. “If there’s a challenge that appeals to you, but you’re not sure if you are up to it, just go for it! Better to try and fail than fail to try”. Find out more about Brutal Events here. Read Beth’s story, the second Double Brutal woman.